Construction of St. Clair Hospital’s new outpatient center is just getting underway in earnest, but it already has a name: DUNLAP FAMILY OUTPATIENT CENTER. “What I find most impressive about St. Clair is that the Hospital continues to function independently by enhancing its services and facilities, while still maintaining the caring and compassion of a neighborhood hospital,” says Ed, who serves as Honorary Co-Chair of the Hospital’s Groundbreaking Growth Campaign, which is designed to raise funds for constructing the new outpatient center and a central utility building to support it. 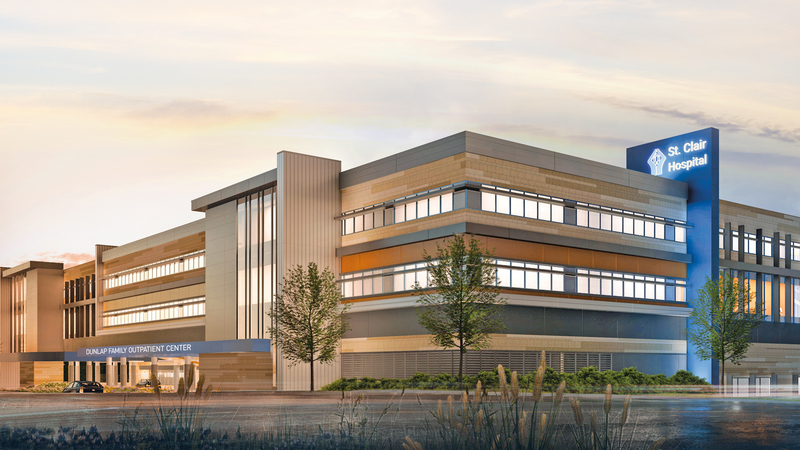 The investment represents the largest expansion at the Hospital’s main campus in four decades and is in response to the 130 percent growth in St. Clair’s outpatient volume since 2006. The new six-story building will offer comprehensive diagnostic and therapeutic outpatient services, including: laboratory; medical imaging; cardio-diagnostics; physical and occupational therapy; an infusion center; outpatient surgery with 10 operating rooms, two procedure rooms, and 51 pre- and post-surgical rooms; a spacious endoscopy (GI) suite with six exam rooms; other multidisciplinary clinical programs; conference space; multiple seating options; a café serving chef-prepared offerings; underground and valet parking; and a commercial pharmacy. To donate now to the Groundbreaking Growth Capital Campaign, click here.